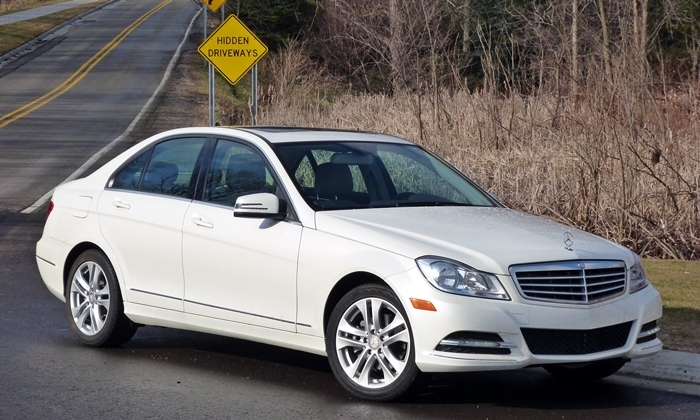 More Mercedes-Benz C-Class photos to go along with Michael's review. Could be sportier, but undeniably elegant. Much less stylish 2008-2014 C-Class. The Cadillac's exterior resembles that of the old C-Class, but edgier. Big star in the grille indicates sport trim. Full-LED headlamps are part of a Lighting Package. Long hood, short deck. Looks a little thick when viewed directly from the side. Almost graceful when viewed from the rear quarter. Artfully sculpted body sides. The interior of the new C-Class is drop-dead gorgeous, especially in red and black. The interior in the previous C-Class looks like a VW's in comparison. Somewhat flashier interior in the Cadillac, but it doesn't look or feel as expensive. The "tacked on" display permits a lower instrument panel. Complicated controls, but most aren't difficult and all are pretty. Best-in-class materials include open pore wood across the face of the center stack. Everything is shiny, but in a way that looks expensive rather than the more common cheap. Systems can be configured separately. I'm not sure what this is trying to say. Driver seat provides very good support, but doesn't feel luxurious. With two more inches of legroom, the back seat is now adult-friendly. If you were expecting the car's bobbed tail to magically include a large trunk...about average. Pop the hood, and all you see is a bunch of black plastic. Remove the cover, and you still can't see the engine.